New Psychoactive Substances (NPS) are often referred to as research chemicals, designer drugs or legal highs. 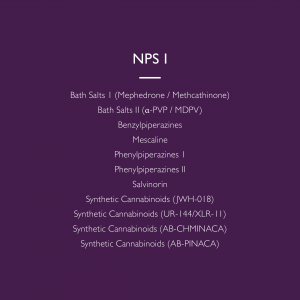 In recent years the number of NPS drugs available has shown an unprecedented increase, coupled with the lack of knowledge on their toxic effects and risks, NPS have been a cause for concern and a key talking point globally, resulting in new challenges for law enforcement, policy makers, drug testing services and scientists. Between 2016-2018, over half of all NPS cases reported involved the consumption of opioids or synthetic cannabinoids, with 52 deaths arising as a direct result of synthetic cannabinoids. These figures suggest that greater detection of NPS needs to be employed at several levels. Designed for high performance across a variety of matrices including urine, oral fluid and whole blood, our NPS I panel on our Biochip Array Technology platform detects multiple NPS drugs from a single sample. Unmatched precision is achieved using our multiplexing technology, eliminating false reporting; maximising laboratory efficiency. Did you miss us in Maastricht? On Tuesday, our Business Development Executive Marie-Anne Gomez presented on The Latest Developments in New Psychoactive Substance Testing at the 6th NPS event in Maastricht, Netherlands. If you missed us, you can visit our website to learn more about our patented Biochip Array Technology and how we are revolutionising drug testing worldwide. Alternatively, you can email info@randoxtoxicology.com to be put in touch with one of our team in your area.